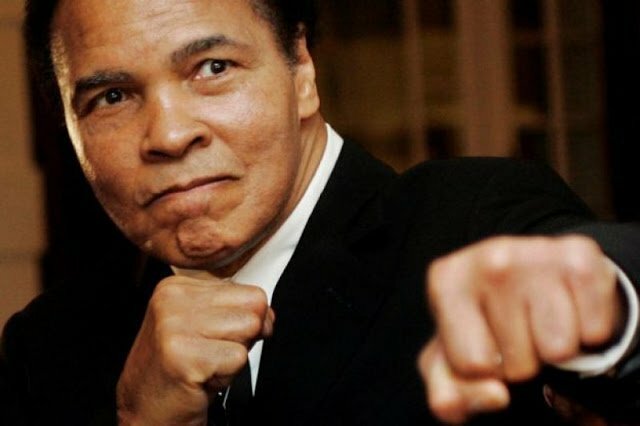 Ali eventually converted to Islam, ditching what he perceived was his “slave name” and becoming Cassius X and then Muhammad Ali. He was handed his first professional defeat by Joe Frazier in the “Fight of the Century” in New York on 8 March 1971, only to regain his title with an eighth-round knockout of George Foreman in the “Rumble in the Jungle” in Kinshasa, Zaire (now Democratic Republic of Congo) on 30 October 1974. Ali fought Frazier for a third and final time in the Philippines on 1 October 1975, coming out on top in the “Thrilla in Manila” when Frazier failed to emerge for the 15th and final round. Ali’s career ended with one-sided defeats by Larry Holmes in 1980 and Trevor Berbick in 1981, many thinking he should have retired long before. Soon after retiring, rumours began to circulate about the state of Ali’s health. His speech had become slurred, he shuffled and he was often drowsy.